Students frustrated with the food options on campus can expect to see relief when they return to campus this fall. Chartwells Higher Education replaced Aramark — the company responsible for overseeing the two dining halls, convenience stores and most of the campus’ restaurants — as the dining service provider for the University of Houston System on July 1, bringing variety, speed and improved quality to students, said Chartwells District Manager David Riddle. The new food provider brings anytime dining to Moody Towers Dining Hall and unlimited meals for students who purchase the 24/7 meal plans, Riddle said, as well as an improvement in quality, variety and speed. 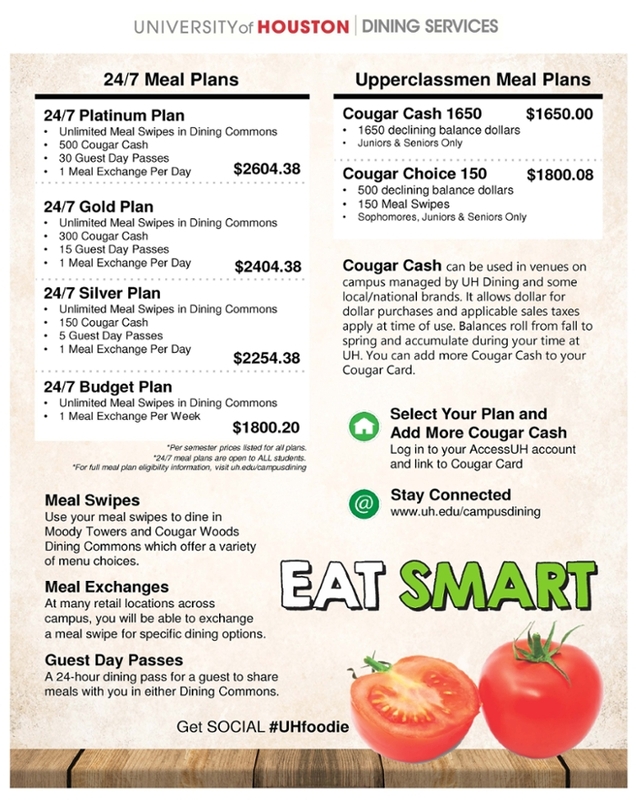 The 24/7 Budget Plan, which is the cheapest of the anytime dining plans, costs $1,800.20 — nearly $300 cheaper than Aramark’s unlimited meal plan, though it’s a roughly 3 percent increase from last year’s base plan, Cougar Choice 150. “I’m never happy about any price increase, but it’s based on the execution: if the execution is good, I think that the students getting a new term is significant,” said former Student Government Association President Shane Smith, who was involved in new contract negotiations until he graduated last May. There is a clause built into the plan to more specifically address the dining needs of low-income student, Smith said, but that will occur in several years once the transition is fully completed and student satisfaction is ensured. That program will make UH one of the first colleges in the country to have a cheaper offering for students who demonstrate a financial need, Smith said. Riddle said there are several new features that he thinks students will be particularly excited about, including a mobile application that students can access to see nutritional information, view menus and order online. All of the big brands and high volume locations will have the app, he said, but some smaller subcontractors will not. Additionally, the Moody Towers dining hall will have a Starbucks component, and the Cougar Woods dining hall will house Peet’s Coffee. Chartwells is committed contractually to provide a higher level of service than Aramark, Riddle said. The contract includes key performance indicators — agreed upon between Chartwells and SGA — to measure service quality, Riddle said. SGA President Winni Zhang will lead the discussion as to what the KPI’s will be, Riddle said. Additionally, the Division of Administration and Finance created a new position: program director of UH Dining Services, said Neil Hart, the executive director of Auxiliary Services. “This is a person whose full-time job is to monitor all aspects of the dining program, which includes perceptions, feedback and making sure that we’re getting exactly what we need,” Hart said. All surveys will be done through a third party — completely independent of Chartwells, Riddle said. Auxiliary Services will hire a third-party secret shopper to critique the dining locations as well, Hart said. Beginning this fall, Chartwells will roll out the beginning of their zero waste-to-landfill program at the Moody Tower and Cougar Woods dining halls, Riddle said, which will include composting and full recycling of plastics, cardboard and metal. “We’re going to make good decisions and try to use the San Francisco city model for sustainability here at the two big dining halls,” he said. The program will be fully implemented by 2020, Hart said.